Aizawl, Oct 17 : A special court here has ordered framing of charges against Opposition leader and former Chief Minister and Mizo National Front (MNF) supremo, in a corruption case. The Special Judge under the Prevention of Corruption Act asked the prosecution to frame charges against Zoramthanga. November 19 has been fixed as the next date of hearing. 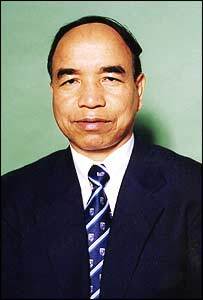 The former underground leader Zoramthanga is probably the first Chief Minister from the Northeastern States to face trial for misuse of government property for personal use. The ex-CM is accused of using his powers as the Chief Minister to get issued Agriculture department materials worth around Rs 37 lakh for fencing his farm at Aipuk, a few kms from the capital in 2007. When the issue was raised in the House by the then Opposition Congress, he is accused of clarifying that the materials were issued to members of an Aipuk Farming Society on 50 per cent subsidy. Official documents were backdated to clear himself, it is alleged. The ACB had filed an additional charge sheet alleging that the former CM held assets disproportionate to his known sources of income but this did not satisfy the Special Judge. But sources said that that the court has permitted them time to file a fresh affidavit on this count. The ACB report said that in 2003 he owned about Rs 54 lakhs which grew to over Rs 1 crore, including various immovable properties showing a massive growth in cash and property assets without any known source of income. It was only in 2009 that prodding by the popular anti-corruption group PRISM through a Public Interest Litigation (PIL) that the government instituted an ACB investigation under the watchful eye of the Gauhati High Court. During the course of investigations his residence was raided recovering several land pattas, passbooks, passports, etc. The former underground leader appeared in the special court in person along with former Cabinet colleagues. He has been consistently claiming that he is being framed for political reasons. Assembly elections is just round the corner in November next year. The other allegation against him is that he had authorised the collection of three per cent from all the PMGSY contractors ostensibly for party funds during two consecutive terms he was CM (1998 to 2008). Far from denying this charge, sources said that the MNF supremo had claimed that all parties including the Congress collected its party funds in this manner.